Performers include: Garrett Dillahunt, Lucas Neff, Martha Plimpton, Shannon Marie Woodward, Skyler Stone, Bijou Phillips, and Cloris Leachman. This sitcom centers around a 23-year-old guy who finds himself taking care of his infant daughter — the product of a one-night stand — after the mother of the child is sent to jail. The series is from Emmy Award winner Greg Garcia who also created My Name Is Earl. As a 23-year-old pool cleaner, Jimmy Chance (Lucas Neff) is trying to find his purpose in life without much success. He still lives at home and goes out every night to help fill the void. His parents, Virginia and Burt (Martha Plimpton and Garret Dillahunt) are happy that he’s old enough to take care of himself. He was conceived when they were 15. They missed out on a lot and want to make up for lost time but are financially strapped. Jimmy’s grandmother, Maw Maw (Cloris Leachman), is going senile and is often unpredictable. She often forgets to put her top on and tries to kiss her grandson, thinking he’s her dead husband. Also living with them is cousin Mike (Skylar Stone). He’s immature and loves to party even more than Jimmy. One night, Jimmy has a one-night stand with a beautiful girl named Lucy (Bijou Phillips). She neglects to tell him that she’s a wanted felon and serial killer. A few months later, he visits her in prison and learns that she got pregnant from the night they spent together. After their baby girl is born, Lucy wants him to raise her. His family isn’t too happy to hear this but Jimmy refuses to shirk this responsibility. They all adjust as best they can and it’s Virginia who suggests the baby be named Hope. While trying to buy things for the baby, Jimmy falls for a checker named Sabrina (Shannon Woodward) at the grocery store but can’t get up to the nerve to ask her out on a date. Virginia’s estranged father, Arnold (Jeffrey Tambor), returns to enlist her help in planning his gay wedding. In return, he promises to pay for Hope’s college education. She reluctantly agrees and ends up enjoying the process because long ago she fantasized about planning her own dream wedding. Maw Maw uncovers that Arnold hasn’t been telling the truth and he reveals that the extravagant wedding is actually for Virginia and Burt. It’s his way of making amends and he has even hired Kenny Loggins to sing her special song. Unfortunately, Arnold has spent all of his money on the wedding and now needs a place to live. Jimmy offers him his old room and Arnold promises to figure out a way to make enough money to pay for Hope’s college after all. What do you think? 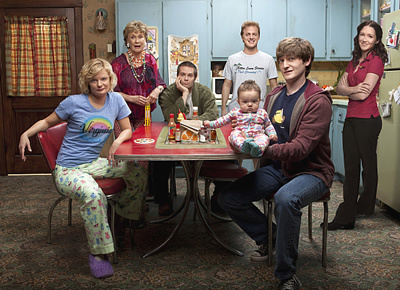 Do you like the Raising Hope TV series? Do you think it should have been cancelled or renewed for another season? Where is Raising Hope on Tuesdays? I so looked forward to watching it! I LOVE THIS SHOW! FOX advertisement does not do this show justice. I hope they don’t make the same mistake as Arrested Developement. That show was more popular after it was cancelled because FOX does not know how to advertise shows. Keep it up, I laugh so hard everytime I watch it! I love this show. It is a very rare occasion that I get hooked on a TV show from the first episode. I DVR this show so that I never miss it. Who would have guessed? What a Hilarious Comedy! Super Cast Combo! We’re a family of five plus a looney, Tooney 80 year old Maw Maw just like Hope has! My teenage kids laugh out loud – Give your writers a Big Raise and keep cranking out more episodes! People at work were telling me how funny this show is, so I went to hulu and watched. The show is great! “Hope” the powers that be keep it on! LOVE, LOVE, LOVE, thats all i have to say! hope they keep it around for a while!!! Holy Cow! I die laughing when I watch this show!!! Love it. This is one of the funniest shows I have EVER seen. Sadly, there are too few sitcoms that even make me smile. This one however makes me laugh out loud every time! Love it! Funniest show ever.Hard belly laughs,…….and tears in our eyes.Keep this show please. I have told everyone to watch this show. It’s rare that a new show gets me on the first episode. I can’t wait to watch the next one. The funniest show ever. I watched it. Then watched it with my wife. Then with my kids. We were laughing so hard. The best show ever.